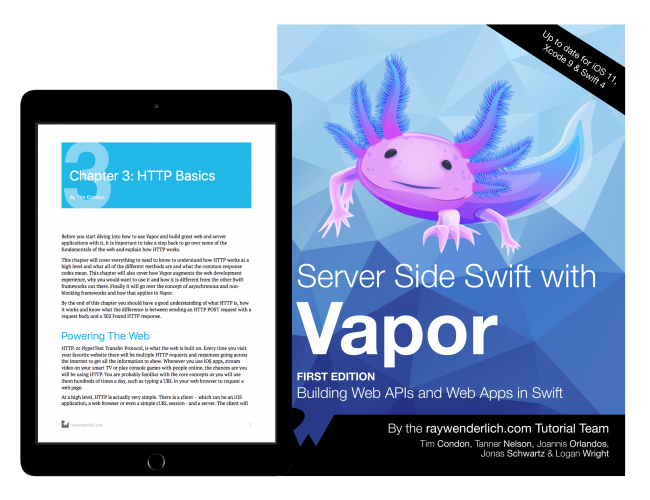 Home Resource Server Side Swift with Vapor: Full Book Now Available! 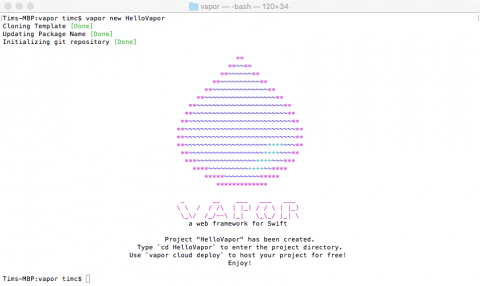 Great news everyone: Our complete Server Side Swift with Vapor book is now available! And best yet, you can still grab it at the special release price — for a limited time. If you’re a beginner to web development, but have worked with Swift for some time, you’ll find it’s easy to create robust, fully featured web apps and web APIs with Vapor 3, and this book will teach you how to do it. What’s Inside Server Side Swift with Vapor? Chapter 1: Introduction: Get a quick overview of the history of the Vapor project and how the book is structured. Chapter 2: Hello Vapor: Beginning a project using a new technology can be daunting. Vapor makes it easy to get started. It even provides handy scripts to make sure that your computer is configured correctly. In this chapter, you’ll start by installing the Vapor Toolbox, then use it to build and run your first project. You’ll finish by learning about routing, accepting data and returning JSON. 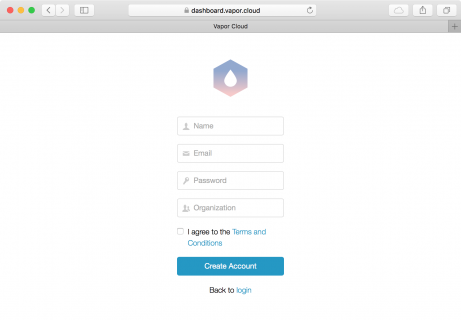 Get started with Vapor — no previous web development experience required! Chapter 3: HTTP Basics: Before you begin your journey with Vapor, you’ll first review the fundamentals of how the web and HTTP operate, including its methods and most common response codes. You’ll also learn how Vapor differs from other Swift frameworks, its benefits, and how it can augment your web development experience. Chapter 4: Async: In this chapter, you’ll learn about asynchronous and non-blocking architectures. You’ll cover Vapor’s approach to these architectures and how to use them. Finally, the chapter will provide a foundational overview of SwiftNIO, a core technology used by Vapor. Chapter 5: Fluent and Persisting Models: In Chapter 2, “Hello, Vapor!”, you learned the basics of creating a Vapor app, including how to create routes. Chapter 5 explains how to use Fluent to save data in Vapor apps. You’ll also learn how to deploy your app using Vapor Cloud. Learn how to deploy your projects up to Vapor Cloud! Chapter 6: Configuring a Database: Databases allow you to persist data in your apps. In this chapter, you’ll learn how to configure your Vapor app to integrate with the database of your choice. Finally, you’ll deploy your app to Vapor Cloud and learn how to set up the database there. Chapter 7: CRUD Database Operations: Chapter 5, “Fluent and Persisting Models”, explained the concept of models and how to store them in a database using Fluent. Chapter 7 concentrates on how to interact with models in the database. 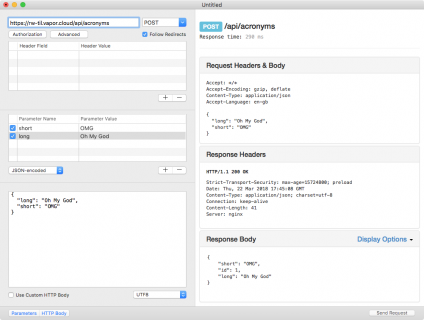 You’ll learn about CRUD operations and how they relate to REST APIs. You’ll also see how to leverage Fluent to perform complex queries on your models. Finally, like all chapters in this section, you’ll deploy your code to Vapor Cloud. Chapter 8: Controllers: In previous chapters, you wrote all the route handlers in one file. This isn’t sustainable for large projects as the file quickly becomes too big and cluttered. This chapter introduces the concept of controllers to help manage your routes and models, using both basic controllers and RESTful controllers. Finally, you’ll deploy your code to Vapor Cloud. Chapter 9: Parent Child Relationships: Chapter 5, “Fluent and Persisting Models”, introduced the concept of models. This chapter will show you how to set up a parent child relationship between two models. You’ll learn the purpose of these relationships, how to model them in Vapor and how to use them with routes. You’ll complete the tutorial by deploying your code to Vapor Cloud. Easily send test requests and try out your Vapor projects with RESTed! Chapter 10: Sibling Relationships: In Chapter 9, “Parent Child Relationships”, you learned how to use Fluent to build parent child relationships between models. Chapter 10 will show you how to implement the other type of relationship: sibling relationships. You’ll learn how to model them in Vapor and how to use them in routes. Finally, you’ll deploy your code to Vapor Cloud. Chapter 11: Testing: In this chapter, you’ll learn how to write tests for your Vapor applications. You’ll learn why testing is important and how it works with Swift Package Manager. Then, you’ll learn how to write tests for the TIL application from the previous chapters. Finally, you’ll see why testing matters on Linux and how to test your code on Linux using Docker. Chapter 12: Creating a Simple iPhone App I: In the previous chapters, you created an API and interacted with it using RESTed. However, users expect something a bit nicer to use TIL! The next two chapters show you how to build a simple iOS app that interacts with the API. In this chapter, you’ll learn how to create different models and get models from the database. Build a simple iPhone app to interact with your Vapor backend! Chapter 13: Creating a Simple iPhone App II: In this chapter, you’ll expand the app to include viewing details about a single acronym. You’ll also learn how to perform the final CRUD operations: edit and delete. 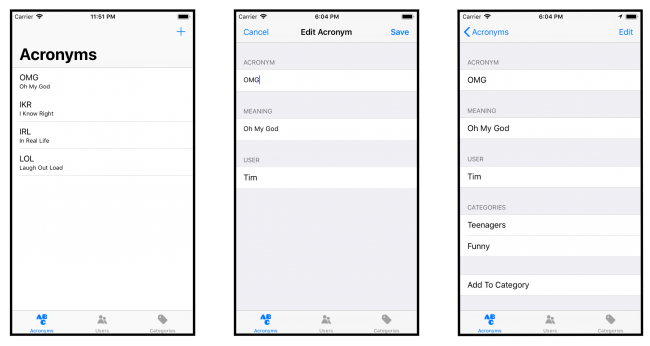 Finally, you’ll learn how to add acronyms to categories. Chapter 14: Templating with Leaf: In a previous section of the book, you learned how to create an API using Vapor and Fluent. This section explains how to use Leaf to create dynamic websites in Vapor applications. Just like the previous section, you’ll deploy the website to Vapor Cloud. Chapter 15: Beautifying Pages: In this chapter, you’ll learn how to use the Bootstrap framework to add styling to your pages. You’ll also learn how to embed templates so you only have to make changes in one place. Next, you’ll also see how to serve files with Vapor. Finally, like every chapter in this section, you’ll deploy the new website to Vapor Cloud. Learn how to style your pages with the Bootstrap framework! Chapter 16: Making a Simple Web App I: In the previous chapters, you learned how to display data in a website and how to make the pages look nice with Bootstrap. In this chapter, you’ll learn how to create different models and how to edit acronyms. Chapter 17: Making a Simple Web App II: In this chapter, you’ll learn how to allow users to add categories to acronyms in a user-friendly way. Finally, you’ll deploy your completed web application to Vapor Cloud. Chapter 18: API Authentication, Part I: In this chapter, you’ll learn how to protect your API with authentication. You’ll learn how to implement both HTTP basic authentication and token authentication in your API. Chapter 19: API Authentication, Part II: Once you’ve implemented API authentication, neither your tests nor the iOS application work any longer. In this chapter, you’ll learn the techniques needed to account for the new authentication requirements, and you’ll also deploy the new code to Vapor Cloud. Chapter 21: Validation: In this chapter, you’ll learn how to use Vapor’s Validation library to verify some of the information users send the application. You’ll create a registration page on the website for users to sign up. You’ll validate the data from this form and display an error message if the data isn’t correct. Finally, you’ll deploy the code to Vapor Cloud. Learn how to use OAuth 2.0 to authenticate your users! Chapter 22: Google Authentication: Sometimes users don’t want to create extra accounts for an application and would prefer to use their existing accounts. 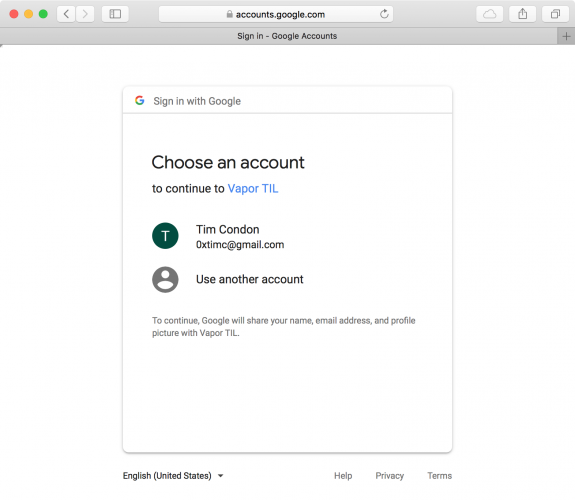 In this chapter, you’ll learn how to use OAuth 2.0 to delegate authentication to Google, so users can log in with their Google accounts instead. Chapter 23: Database/API Versioning & Migration: Once you’re in production, you can’t just delete your database and start over. Instead, you can use Vapor’s Migration protocol to cautiously introduce your modifications while still having a revert option should things not go as expected. Chapter 24: Caching: Whether you’re creating a JSON API, building an iOS app, or even designing the circuitry of a CPU, you’ll eventually need a cache. In this chapter, you’ll learn the philosophy behind and uses of caching to make your app feel snappier and more responsive. Learn how to create middleware for Vapor to view and modify requests! Chapter 25: Middleware: In the course of building your application, you’ll often find it necessary to integrate your own steps into the request pipeline, via middleware. This allows you to do things like log incoming requests, catch errors and display messages, rate-limit traffic to particular routes and more. Chapter 26: Deploying with Heroku: Heroku is a popular hosting solution that simplifies deployment of web and cloud applications. It supports a number of popular languages and database options. In this chapter, you’ll learn how to deploy a Vapor web app with a Postgres database on Heroku. Chapter 27: WebSockets: WebSockets, like HTTP, define a protocol used for communication between two devices. Unlike HTTP, the WebSocket protocol is designed for realtime communication. Vapor provides a succinct API to create a WebSocket server or client. In this chapter, you’ll build a simple server/client application that allows users to share their current location with others, who can then view this on a map in realtime. Don’t wait though — the release price is only good until the end of Friday, August 17. I’d hate for you to miss out! Whether you’re looking to create a backend for your iOS app or want to create fully featured web apps, Vapor is the perfect platform for you. This book starts with the basics of web development and introduces the basics of Vapor; it then walks you through creating APIs and web backends, shows you how to create and configure databases, explains how to deploy to Heroku, walks you through implementing OAuth 2.0, how to perform nearly effortless migrations, how to work with WebSockets, and more! 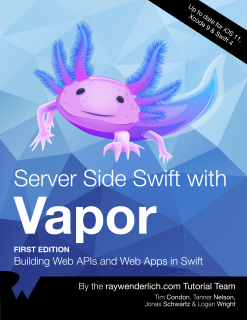 The Vapor book team and I truly hope that you enjoy Server Side Swift with Vapor! FinTech Regulation Bridges Silicon Valley and Washington D.C.